Paying for Recordings, On Your Honor! Updated January 22, 2013. People have been inquiring about CD's for sale, my Facebook pages and the growing number of YouTube videos. So here are the links you need. CD's. I no longer make plastic products. My two albums are here online for either streaming or download. Just look in the left column and click on The First Album or Twin Fiddle Favorites. Payment is by donation. See the link to the left Paying for Recordings. You are welcome to burn your own CD's after downloading. YouTube videos. There are about 30 videos on YouTube that feature Henry all or in part. 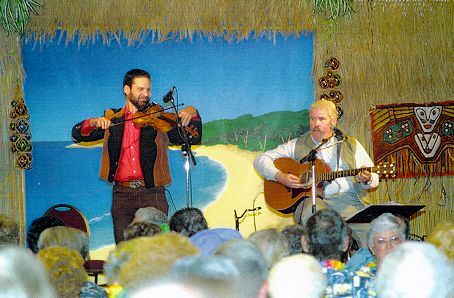 Just click here: www.youtube.com "henry the fiddler"
The Rainbow Way (added here April 23, 2005), was recorded live July, 2001 at the Idaho Rainbow Gathering. It was discovered at this welcomehome.org music page by my fellow Rainbow picker Julia Farver, who just emailed it to me. I was so blown away by this 6.5 minute recording that I just had to post it here for your enjoyment. I first heard Pete Seeger do this "multi-part group sing along" of the traditional African tribal chant Wimoweh (The Lion Sleeps Tonight), as a child growing up in Evanston, Illinois. A few decades later while singing and fiddling around a huge campfire at the 1979 Arizona Rainbow Gathering, we found ourselves morphing Wimoweh into the Rainbow Way. It has since been sung often, around the world, as it was on this warm night in early July, 2001 at the "Annual Rainbow Granola Funk Talent Show". I was having so much fun, I didn't even realize someone was recording. A fellow Rainbow brother named Tenali made this recording on a Sveony Minidisc with a very high quality mike. If you have a good pair of headphones, try plugging them into your sound card, turn up the volume, close your eyes and join us! Also, on March 8, 2008, this Rainbow Way mp3 was made into a YouTube slide show. You'll find it embedded down at the bottom of this page! payment instructions: Paying for Recordings, On Your Honor! Special bonus: 1 minute YouTube videos with Brian!